As we near the end of July, I’m about halfway through Draft #2 of WINTER: Book Four of the Lunar Chronicles, so I thought this would be a good time to talk about my process for tackling this book, before I forget what I was doing when I took all of these very impressive looking photos. For me, the first draft of a novel is all about getting to know the characters and figuring out what this story is about. Although I’m an outliner, the first draft inevitably veers away from that outline as I uncover plot twists that hadn’t occurred to me and character motivations that I’d been previously unaware of. Which makes the second draft the “making it all work” draft. Now I know where I’m going with the plot, the major points I want to hit, and I have a general idea of how the characters grow and change over the course of the story. I just need to rewrite, revise, and re-arrange it all in a way that makes sense and (hopefully) keeps the reader engaged throughout it all. This is the process I devised for wrangling the massive, complex plot I’d unearthed in WINTER’s first draft. 1. Read through the draft. First, to refamiliarize myself with the story (which I wrote in early 2011), simultaneously taking notes on things that need to change and things I think could be stronger: where the plot gets convoluted, where character motivations seem weak, what is working and what isn’t. I may make notes in the file for smaller changes I plan to make, but I don’t bother changing anything right now. Mostly I’m just making a list of ideas as they come to me. 2. While reading the draft and taking notes, I also make my scene list. The scene list is easily my favorite tool when it comes to revising. Simply: It’s a list in which every scene in the book is summarized down to just two or three sentences. It allows me to see the major plot points and how the story progresses from beginning to middle to end, without getting bogged down with any superfluous information. 3. 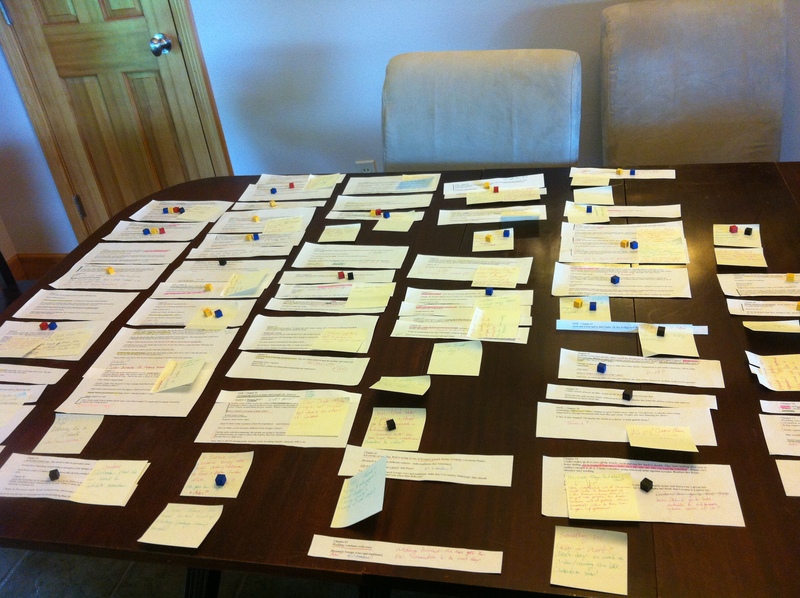 Determine the major plot threads and subplots—assign each one a color. WINTER is the first book for which I’ve been this neurotic about keeping my subplots straight, but it’s complex enough that it felt warranted. Every major conflict (the war, the plague, Cinder vs. Levana), every major character arc, every romantic subplot—they all need to have something that resembles a beginning, a middle, and an end. They all need to face obstacles and set-backs. They all need to grow and change over the course of the story. All in all, I counted sixteen plot threads in WINTER. That’s a lot to keep track of! 4. Using their assigned colors, I indicate each plot thread throughout the scene list. Does this chapter relate to Winter’s character arc? Does this one involve a new obstacle in Cinder’s attempt to undermine Levana? Then it’s highlighted to correspond with that plot thread. Most chapters relate to more than one subplot at a time, and you’ll probably find that the most pinnacle chapters often bring three or more subplots together all at once, so this can get messy. But then, when you’re done highlighting, you are given a very telling view of your entire book. 5. I separate the scenes and lay them out by subplot ,so I can work on each one individually. After cutting the scene list into little strips of paper, so that each scene is on its own, I pull out one plot thread at a time and begin to analyze. What could I do to make this plot thread stronger? How could I reorganize the events to make them more suspenseful? What obstacles could I add to make it more intense? Note: I found that this method only worked for about a third of my plot threads – namely, the major ones. Subplots, such as how a character grows during the story, or the romance arcs, tend to hinge on those other major plots, and are therefore harder to isolate. 6. Put it all back together. This requires much staring and thinking and brainstorming. Much shuffling around. Many notes about what will change in each existing scene. Many sticky notes indicating brand new scenes that need to be added. Much more rearranging. Until finally I felt as though each major plot works together and plays on each other to create a single interwoven story. 7. More color-coordinating. By this time, all those pretty highlights I’d made at the beginning had stopped being effective because things had changed so much. So I decided to use colored markers I’d found in a board game to once again indicate which scenes related to which plot threads. Once again able to see (at a glance) which subplots were weak or unbalanced, I added more notes and more scenes to strengthen them. 8. Transcribe the changes to thescene list (or Scrivener). Once I felt that I had done as much as I could to make a strong novel, short of actually writing it, I made the necessary changes on my Scrivener cork board (or you could notate it all on that handy dandy scene list). I rearranged the scenes from the first draft that needed rearranging. I added the summaries of the new scenes I’d come up with. I made notes about ways to show how this romance is tried in this chapter, how this character is made to question their motives here, how this chapter is meant to bring closure to this particular subplot, how I must mention here that the character has a weapon (foreshadowing a time in the future that they’ll have to use it), and on and on. 9. Then, finally, I start in on Draft #2. Self-explanatory, I hope. This entire process took about two weeks, which is significantly longer than I would normally spend on planning a revision draft, except this book is just so long and so complicated. In the end, I suspect taking the time to do this has saved me months of additional revision work. That said—I wish I could say that putting all this forethought and planning into my first revision draft has made it an absolute breeze. But the fact is, no amount of planning will keep plots from shifting, character motives from changing, and little interesting details from creeping up during the actual writing of a scene and throwing you for a tailspin. 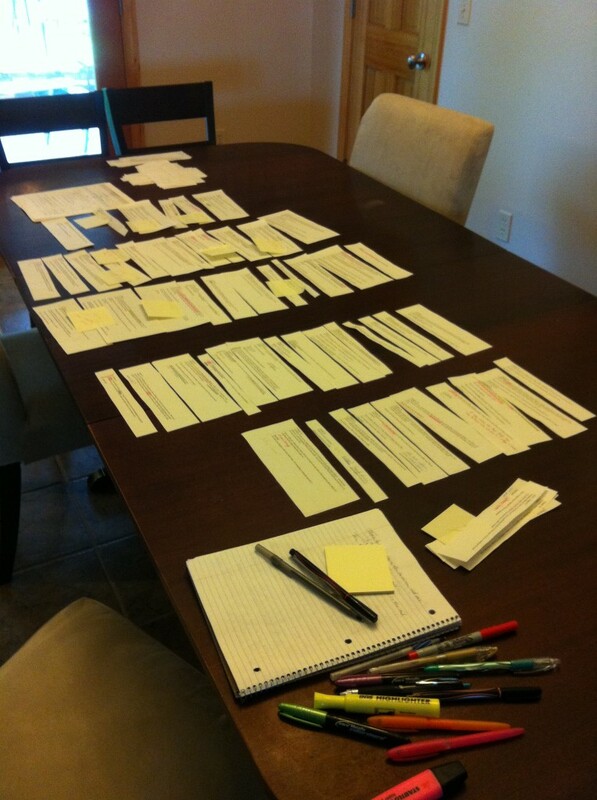 I’m still constantly making changes to that scene list and reworking plot threads that had seemed perfect when they were laid out on my dining room table, but I’ve since realized have an unexpected flaw in them. I’m already making a list of things I want to change and fix in Draft #3. But this process has given me a foundation to work from, and the confidence that—no matter what changes—this story has a beginning and a middle and an end, and all plot threads are at least accounted for. There will be more work to do later, but this gave me a place to start, which is often the scariest part of any draft. But this is definitely some of the best writing advice I’ve ever gotten. I’m just about finished with my first draft, so this is so much help!! Thanks! Wow…it’s always really cool to see someone’s process when it comes to writing. I’m not sure all of this would work for me (I panicked at the sight of all that paper) but I’m definitely going to try and tweak it! A scene list is a fantastic idea and since I’m at the end of draft #1 it would be incredibly helpful. I’m torn. 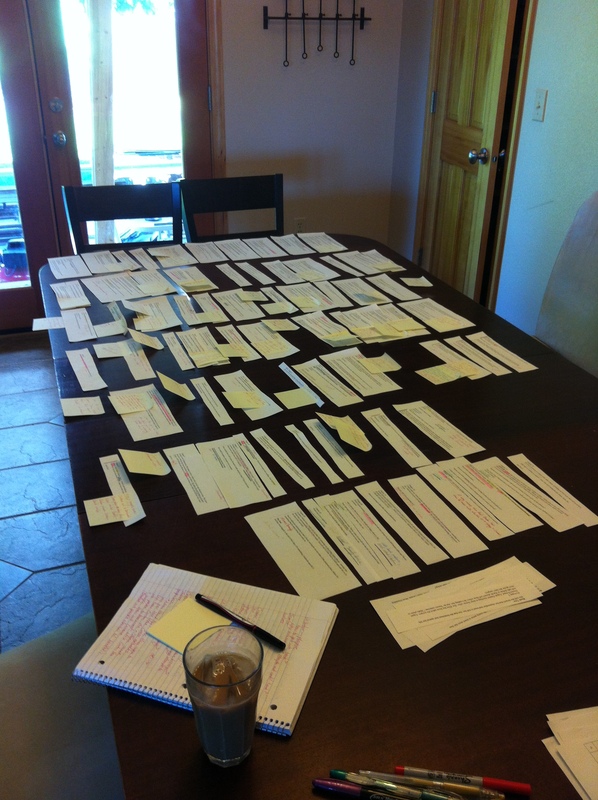 I don’t know that I could ever be that organized planning my novels–l lean far more toward the pantser. And yet your novels are so beautifully written, and well-plotted, it makes me wonder if there’s something to being this organized and detailed (I’m sure you don’t think of it as detailed, but to me it is). How do you go about writing draft #2? Do you start from scratch and re-write everything into Scrivener, or do you import what you have previously written in draft #1? Hi Brian, I begin by importing everything I’ve written into Scrivener and dividing it into chapters. Then I go through, chapter by chapter, and begin making the changes that I’ve decided to make using the above process. Wow, I was being very organized when writing my stories however I couldn’t came up with some order hoe to get all the ideas together and sorted out so I won’t mix anything up later on as it became hard for me to write more than 10 chapters to remember weather I haven’t already told what I wanted… this sums everything up! This was really interesting (and helpful from a writer’s perspective). It’s definitely given me inspiration for how to tackle my next redraft. It’s cool that you use Scrivener too, I’ve only had it for a couple of months and I’m still getting to grips with it, but it sounds like it can be really helpful once you’ve worked out how to make the best use of it. It’s also really exciting to get a Winter update. I’m really looking forward to reading Cress! This was a very motivating blog post! It makes me want to sit down and start writing. But when you mentioned balanced/unbalanced plots (major plots, subplots, romantic plots, character arcs, etc.) it made me curious. How much do your numbers vary between the different types? I LOVE seeing all the paper! I can’t get any revising done until I print. I know some people can do it on a computer screen, but not I. I’ve been (literally) cutting and pasting for years. First of all, that was a really interesting and insightful post! Thank you! I think the amount of thought and preparations put into your work is stunning and inspiring! I’m a HUGE fan of yours, and if it’s possible my respect to you and your writing just went UP after this post. You’re incredible, and never stop writing! Thanks, everyone, I’m so glad you’re finding my crazy process to be inspiring! – and sometimes you’ll find an additional subplot or two that involves something from the protagonist’s home life, such as a problem they’re having with a friend or family member, or their job, etc. In the best books, all of these things overlap and work together to make the story, rather than feeling like many separate stories that just happen to be taking place at the same time. WINTER is an unusual case with its 16 plots threads, but then… I do have 9 major characters, so what can I do? This is inspiring! I can see how -though it’s a lot of work- it saves you a lot of time in the end to do it this way. Thanks for being so detailed with pics–I’d like to try something similar for my final draft! WOW O.O This is one incredible and complicated process. Obviously it is quite effective 🙂 I love color coding things, so maybe I will have to try something similar when I get to this point in my own story. Very insightful and motivating! Impressive! No wonder my daughter brags about you! Thanks for the tips. I’m still working on my 1st draft, so this will be very helpful for my 2nd draft. I’m also an outliner. Like you, I let the story veer away from the outline as it wants to. Yesterday I worked on a portion of my story where my antagonist was supposed to ambush my 2nd protagonist, and then the 1st protagonist was supposed to show up. Instead, my 1st protagonist showed up, and then they were both ambushed by the antagonist. I have no idea how that happened, but the story is far better than my original plan. 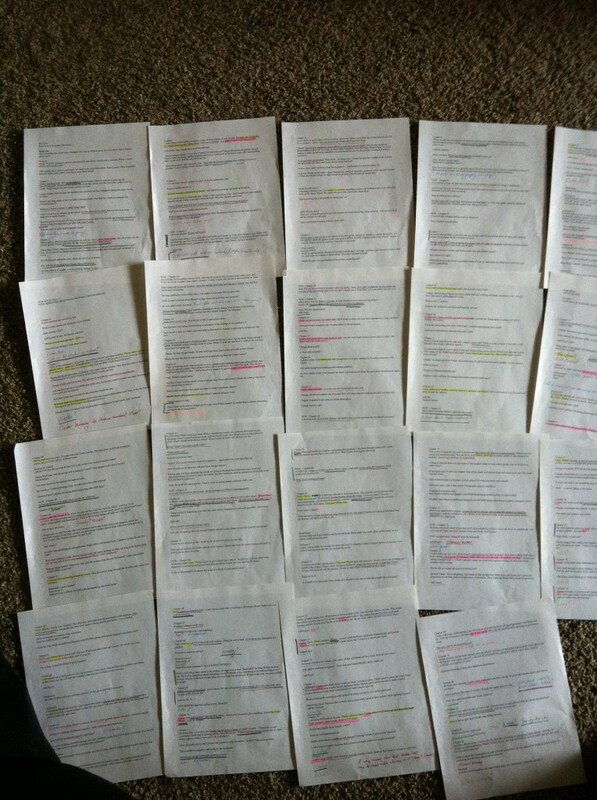 I’m looking forward to finishing my 1st draft so I can start using your color-coding methods for my revision. Thanks again for the info. Hi, that are a good article. Wow. I’ve written four books in the past year and my planning is literally (a) what are the major plot points that I need to address throughout the novel and (b) actually sitting down and writing the story. When I told my writing group friend I was struggling with my synopsis she suggested that I read your blog. What excellent advice you give. You are so organised! I don’t know if I can plan to such a detail as you do, but I will digest and apply some of these to my own process and hopefully improve and hone it. Hey Marisa! I’m a huge fan of your work! I had a quick question. How much detail do you put into your scene list? I know that you said you narrow them down to 2-3 sentences, but how much do you give in those sentences? Thanks for being a really big inspiration to everyone, and I hope you write more FREACKING AMAZING books in the future!